There's a wearied grimness in the air at the moment. A snap election called while the opposition were in disarray, at a time of rising hardship and poverty in this country, and under-funding of public services - scandalously so, given this nation's wealth and resources. Elsewhere too, the news is unrelentingly worrying and wearying, while even our weather has decided to suspend spring and remind us what winter feels like. So this image, which appeared in my Facebook feed this morning, was a welcome reminder of the many moments of happiness which can permeate even the most ordinary of days. I love the fact that these examples are "ordinary" and everyday. They're not confined to specific, life-changing events or memories. In the hierarchy of happiness they rank well below those truly sublime joys, such as knowing - really knowing - we are loved, the delight of a long-awaited reunion or the elation of hard-won achievement. Instead, I am reminded of the childlike happiness engendered by observing bees or butterflies, marvelling at dappling or seeing sea monsters in a weirdly shaped tree; the ridiculous, satisfied happiness brought on by surveying a gleaming, newly-polished sink, and the blissful happiness of snuggling up in bed, especially in freshly-laundered sheets. And alongside these, those moments of joy and contentment which are indeed strange or mysterious, or simply beautifully delicate; hard to define or even pin down, but no less precious for that. Yes, all ordinary, all easily overlooked or taken for granted, especially when times seem unremittingly grim - but all present and woven into the very fabric of daily life. 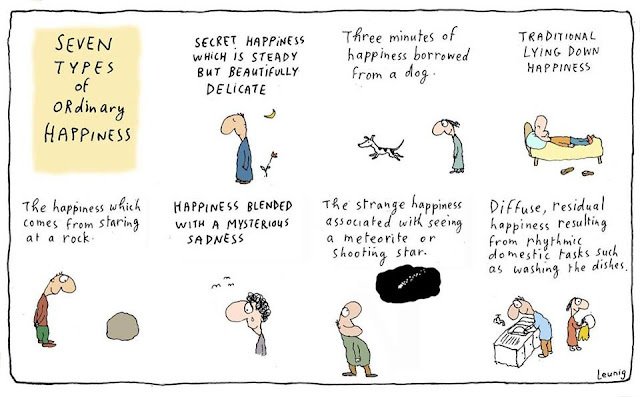 How many types of ordinary happiness can you see in your everyday life?